It’s home improvement season, so how do you find a contractor you can trust? Fixing your home, instead of moving, is often a good option but most people look forward to a reno about as much as they would look forward to having a root canal done! And that’s understandable. If you don’t have a general contractor in the family and you’re not usually in the market for major renovations, it can be daunting to think about hiring the right person for the job. There are some ways, however, that you can cover yourself and get the best possible outcome! The first and best way to find a contractor who will do the job right is to get recommendations from friends and family. If they’ve had a good experience, they will be more than willing to share the information with you, and you will be able to trust what they are telling you about the contractor. Associated businesses. For example, if you have a local landscaper that you LOVE, he or she may have a contact for you! Closed Facebook groups of people who live in your area. For example, I am a member of a fabulous ‘mom group’ for my area. The questions moms ask on there are for all sorts of referrals, not just kid related ones! Organizations like Homestars, where you can see reviews from other people who have used the services. Of course, you have to take online reviews with a grain of salt, as some people will complain online about things that aren’t really germane to the project, but overall, if you see a lot of positive or a lot of negative reviews for a certain contractor or company, it will give you a sense of what you can expect. When you’ve compiled a shortlist of contractors from your referrals or research, it’s time to call them and ask a few questions. Like what? Will they be doing the work themselves or subcontracting any or all of it? Look for specialization—do they normally do this kind of work or are they focused on different projects from yours? There are often strict building codes for different types of renovations. Would you hire a real estate lawyer to handle your divorce? No? Think the same way about your contractor. Can they provide you a list of previous jobs in the area, and references? How many projects do they typically take on at the same time? Confirm liability insurance coverage and company. You’re looking for reliability here. Are they evasive? Do they seem open to your questions? Gut instinct counts for a lot at this point in the process so go with it. Communication is the number one factor when dealing with a contractor so when you invite them to come in and do up an estimate, this is your chance to evaluate. This person is going to be working in your home, around your family, possibly at moments when you aren’t there. You have to feel comfortable with them. HOWEVER, don’t hire them just because they are nice. Nice doesn’t mean qualified. Ask them to estimate / bid with a full breakdown so that you can compare the bids fairly: cost of materials, cost of labour, and other expenses. Generally materials account for 40-45% of the total; the rest includes overhead, labour and a profit margin, which sits typically around 15 to 20% of the total. If you think you’ve found the right contractor, check with the Better Business Bureau for any indication of disputes or issues; or if they list themselves as having certain ratings or certifications, check those out with your city and make sure they do in fact have them in good standing. This is also a good time to call some of the references they provided. If possible, visit an active job location so you can see the quality of the work, the neatness of the site, etc… This will give you a clear indication of the work. A typical payment schedule set up should look something like this: 10% of the estimate due at signing, 25% in each of 3 payments spread over the projected duration and 15% when the work is completed and you are satisfied. If you get four estimates and one is really low, it’s tempting to go for that one but what it should be is a red flag. A contractor who lowballs by a significant amount is either cutting corners or is desperate for the work. Either way, it won’t be a good result for you. This is your home. Cheaping out will only cost you a lot more in the long run, when you have to have extra work done, repairs made or if the contractor gives up altogether. Contractors who insist that they don’t need a set of blueprints for an extensive job. If the contractor won’t provide proof of insurance, beware! A contractor who wants 50% or more of total estimate upfront. They are having financial problems or else know that you won’t be satisfied with the job and want to get maximum funds right away. Offers you a ‘today only special’ where you have to sign now or it’s gone! This is one of those times where you don’t want to be pressured. Tries to scare or bully you into using more expensive materials. If they asks you what the other estimates come to, and you mistakenly tell him (don’t do that, by the way!) and then he lowballs a figure from that? Run! Your home is likely your most valuable asset. You need to be careful when putting it in someone else’s hands to be altered, repaired or improved upon. Do you have any tried and true tips to finding the contractor of your dreams? 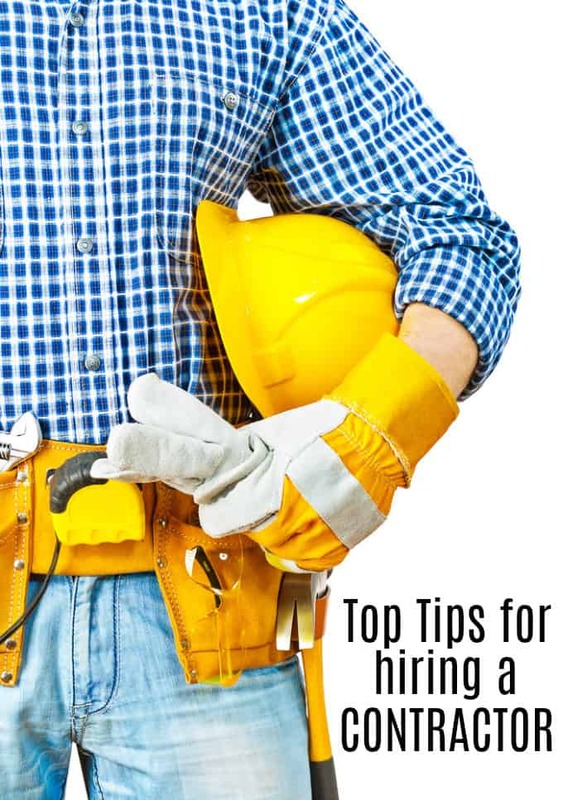 Thanks for the tips it’s best to do your homework before you hire someone ! Super tips, I’ll be sure to keep them in mind if ever I need a contractor. We did have someone in to correct a lot of things in my apartment in the basement that the builder insisted were fine – freezing water pipes (they were on the wrong side of the insulation! ), the heating (turned out that some pipes weren’t even connected! ), ice on electric outlets (scant insulation!) etc. He was marvellous and the other people needed like a plumber were people he knew and trusted. A good job done by all and I’d certainly use him again and recommend him to others too – I just wish he’d built our house from the ground up! Great advice! DONT finish paying until job is inspected and completed!!!! !